Thursday action in the Western Hockey League promises to be a hit as the Prince Albert Raiders (40-5-0-2) and Vancouver Giants (29-12-2-0) clash on Sportsnet East, Ontario, West, and Sportsnet 360 at 10:30pm ET/7:30pm PT. 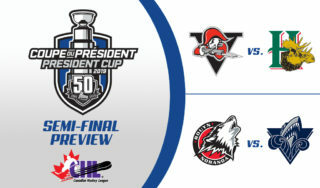 The hosting Giants will look to hand the Raiders just their sixth regulation defeat this season – Prince Albert hasn’t lost in 60 minutes since a 4-1 upset to the Seattle Thunderbirds on Jan. 9, and has since posted a 5-0-0-1 record. Earlier this season, the Raiders pieced together a 19-game win streak before falling to the Swift Current Broncos. 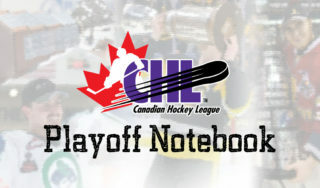 Prince Albert enters Thursday’s contest coming off a 4-1 victory over the Victoria Royals, who trail the Giants by 13 points for top spot in the B.C. Division. 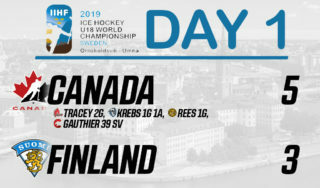 Cole Fonstad, a Montreal Canadiens prospect who sits third in team scoring with 48 points, led the way for the Raiders with one goal and one assist, while netminder Ian Scott, a fourth-round draft pick by the Toronto Maple Leafs in 2017, turned aside 20 shots for his 28th victory on the season. Scott sits atop the WHL with a 1.79 GAA and a .936 SV%. 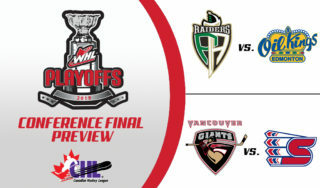 Meanwhile, the Giants will look to push their win streak to seven games following a 2-1 overtime victory over the Moose Jaw Warriors in which over-ager Davis Koch and 2019 NHL Entry Draft hopeful Bowen Byram provided the offense for Vancouver. Koch (16-31-47) and Byram (16-27-43) sit first and second in team scoring. The Giants’ six-straight wins follow a recent skid where the club dropped four consecutive contests in regulation. The Raiders and Giants continue to work new personnel into their lineups as both clubs were active ahead of this month’s trade deadline, as Prince Albert brought in multiple players, including netminder Boston Bilous, previously with the Edmonton Oil Kings, plus defenseman Loeden Schaufler, who joined from the Thunderbirds, while the Giants added blue-liner Dallas Hines in a deal with the Kootenay ICE, as well as centre Jadon Joseph, who had split the 2018-19 campaign between the Lethbridge Hurricanes and Regina Pats. Thursday marks the lone meetup between the Raiders and Giants this season. Catch all of the action on Sportsnet East, Ontario, West, and Sportsnet 360 and in the United States on the NHL Network when the puck drops at 10:30pm ET/7:30pm PT.